we started the theory session about abseiling at 9am, and completed a 2m ground training by 12pm. 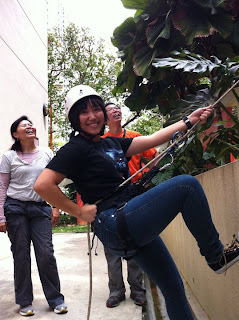 at 1pm, we started to abseil from both the staircase, and the rooftop. i started at the staircase, and had to go twice, as i failed the first descend. reason; i wore a glove on my breaking hand, and could not feel the rope. i clutched too tightly, so my hand got tired pretty fast. after the 3rd floor down, i stood on the railing to readjust my breaking hand. i let go of the rope. failed. so i tried a second time. on my second try, i went down without gloves. the rope slipped even though i gripped as tightly as i could, so i decided to just complete the descend faster. my both hands had rope burn after that. 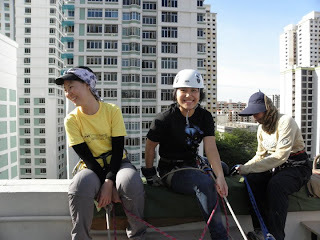 the second abseiling point was from the rooftop. i feel that this descend was easier, and at every point in time, there is a wall for me to place my legs on and steady myself. to me, the descend was much easier than the staircase. for campwash, my group kept the equipment/tents. due to the heat from the afternoon sun, the tar on the roof melted, and keeping the tents was a lot harder than normal. at the debrief, we were informed of the various levels of abseiling courses we could undertake, and which would allow us to do what. i am currently considering going for APC 2, which allows me to self-belay, which is necessary for abseiling waterfalls and caving.